Titan Creative Entertainment proudly presents our premier tribute to two country heroes and legends, Willie Nelson and Waylon Jennings. Willie Nelson is America’s best know and most loved songwriters of all-time. After writing monster hits like “Crazy” Nelson began working with Waylon Jennings in 1975. They recorded an album called Red Headed Stranger which included Willie’s first number one hit “Blue Eyes Cryin’ In The Rain”. The Titan duo of WAYLON & WILLIE is comprised of two veteran entertainers that both physically and vocally bear unmistakable resemblances to these two founders of Outlaw Country. 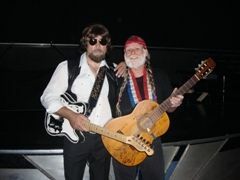 From the songs to the swagger to the stories, WAYLON & WILLIE will take your respected guests and patrons on an unforgettable journey across time and through the American heartland as seen by the eyes of Willie Nelson & Waylon Jennings. Book a Production Show, Original Artist, or any of our talented acts Today! What date are you interested in? © 2018 Titan Productions. A division of Titan Creative Entertainment Inc.